First off, if you haven't seen the original series, Teekyu, then you probably don't know what you are getting yourself into. Thankfully, each episode is around 2 to 3 minutes, so you can easily get through the entire series of Teekyu (currently) in about an hour or two (maybe 3 if you need to pause) and this series in less than an hour. The voice actors are speaking very quickly so the translations are quickly being shown one after another. It is lightning fast, so if you need to pause, do so. I have, and I'm still enjoying both series. Both series hits you with so many random funny bits that you barely have time to react before the next bit hits you. Could it be slower? Sure. Could it be just as funny? Hard to say, its the shock factor that really sets these series apart from the other comedies. I find myself repeating the episodes just to laugh at the other bits that I might have missed. Plenty of references to other animes, movies, and just general pop culture. about girl who all infinty stones have fallen into the wrong hands. all 6 infinty stone: Mind stone, Soul stone, Space stone, Time stone, Power stone, Reality stone, Bird stone. Girl free manipulation of world around her COME OUT OF COMPUTER KILL ME REAL. Not worth my Jahcoinds. Takamiya Nasuno Desu! is a spin-off of Teekyu, borrowing most of that show's formula and humour - the 2 minute episodes are extremely fast paced, with random, absurd humor. The plot (if you can call it that) focuses on Nasuno, who forces Yuri's younger brother Yota to be her butler. Even the unnecessarily long opening is in place, once more with pretty good music and funny visuals. All that said, it's not as good as the main series - first two episodes are somewhat bland and while Nasuno and Yota are good characters in their own right, they just don't have the charm and chemistry of the main cast. The best moments of the show are the episodes when all four girls from Teekyu are present, other than that it produces some very amusing gags, but rarely reaches the quality that the main series got us used to. In summary, this series is definitely targeted towards Teekyu fans and for them it should be worth watching, even if just for the episodes where the full cast is present - those just feel like very good specials. For everyone else, I would suggest checking out the main series and maybe even Usakame spin-off first and then deciding whether you're interested in watching more. I started watching this only because it was so short. Good filler for waiting or breaks. However, I often found myself lost at what was going on. Sometimes I would just ask myself what I just watched because I would miss the punchline or I swear blink and miss half of the scene. I watched this before the original show, and I can't say I'm much of a fan either way. Do you like Teekyu? If you do, there's no reason to read any further, you'll dig this. If you don't, same thing, you'll hate this. Don't waste your time. For those of you on the fence, *Takamiya Nasuno Desu! *, like its parent show (which you should really watch first) is a bite-sized sugar rush of rapid fire surrealism that only qualifies as comedy because it leaves you in a baffled giggling stupor at the end of each episode. If it was all *pure* randomness, it might not be so funny, but TND operates on its own internal wackyland logic, taking place in a universe where rich people travel by bird and people change into swimsuits in microseconds. It's all very zany, and I have to imagine that it's a nightmare to write and storyboard a show like this. It must take a gargantuan amount of subtlety to be so unsubtle. This is one anime I am proud to say I can keep up with without having to rewind or put in slow motion and the only reason why I can keep up with this is because if i tried i could easily talk like this. I am a multi tasker all I can do is think fast about several different subjects. It takes skill to be able to listen to this and even more to read it. I pretty much said it in the title. 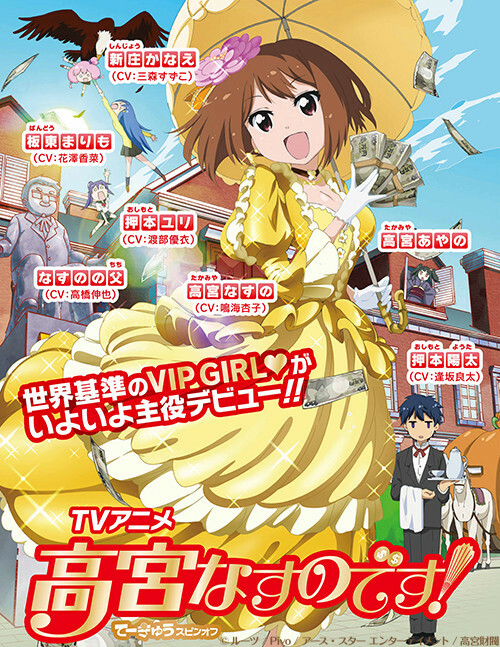 If you liked Teekyu, this is pretty much the same exact thing, but with one of the characters from that show and how expensively rich she is and the shenanigans she and her family get up to. Pretty quick watch. Use it to unwind between long series.